Bringing the stream to you! 2019 will see a big transformation in Onstream-guide as the web site will be improved and updated. Don't panic this will remain a free instructional site for all those interested in river fly fishing for trout...new You Tube presentations are in the pipeline. All our modern UV Czech sourced materials are back in stock including the much requested black UV hares ear incorporated into the deadly black magic nymph. The heavyweight Maruto 14 is back on which the Onstream-guide soft hackle dry fly is based and our UV hares ears dispensers. Forget other dubbing this stuff is finger silk and with a proven fish catching record. We have some great new products including new hi viz nymphing lines and great indicator systems. We also have a limited run of very special Coq de Leon feathers! Enjoy the site and watching it as it transforms. Are you Passionate about river fly fishing and want to be on the stream now or just a curious fly fishing beginner? Do you know your French nymphing from your Czech nymphing and is either legal? Welcome to the wonderful and dynamic world of river fly fishing for trout and grayling at onstream-guide.com. Whatever your level from complete novice to seasoned trout bum you will find something here to help you catch more fish. The effectiveness of the flies is self evident and all the flies catch stunning wild trout and grayling! For more info please click here. Starting river fly fishing? Then you are probably confused. Just hit the nav bar. Things will be clearer soon. Or perhaps you are looking to learn new modern fly fishing techniques? All are here explained and demonstrated with videos. So you can understand the principles of fly fishing methods and try them on your own rivers. Techniques with names shrouded in mystery like European style nymphing including French nymphing, Czech nymphing and Polish nymphing. The Duo, streamers, tenkara are covered as well as more mainstream and well loved techniques like upstream dry fly. Looking for some new effective river fly patterns? The ones that really work rather than those that only catch gullible fly fishers. Flies that have caught fish in the streams of Alberta, Colorado, Europe and the Himalayas. Innovative patterns like the soft hackle dry fly, or the black magic nymph a modern version of W.C. Stewarts famous black spider. They are all here as well! If you like to create your own fly patterns we have a range of the highest quality materials imported from the home of modern river fly fishing the Czech Republic. Step by step fly patterns are here and will be added to. 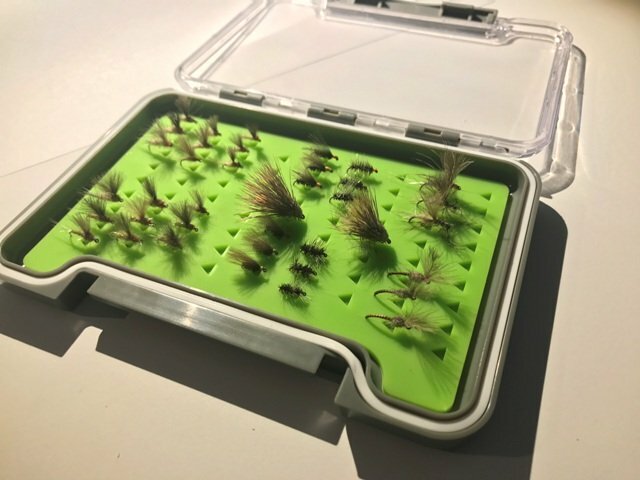 TheOnstream-guide Fly Selection Boxes offer excellent value for money... For more info visit this page. Do you struggle with your river fly fishing? Only catch a fish or two? Perhaps you want to make the transition from still to moving water? Or just improve your approach and catch rate by learning the art of improved presentation. A day or more with an experienced guide is the way forward. I guide on the most beautiful, unspoilt wild trout streams in the North of England in an area of outstanding natural beauty. If the idea of catching pristine wild fish in spectacular surroundings sounds appealing then please see more details on the stream guiding page. Onstream-guide is a small stream growing bigger. There are regular updates and new E-zines for subscribers (Subscription form on this page!). This is free information on all items Onstream-Guide and fly fishing related. Be sure to check your Onstream-Guide on regular basis! Please feel free to ask any questions using our Contact Us form. New Asso Soft Coplolymer now in stock. This is a great dry fly tippet. Check it out on the leader page.